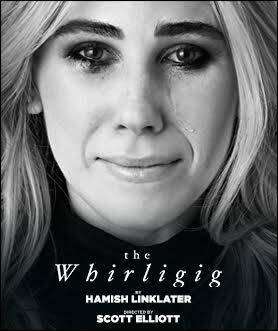 WHIRLIGIG by Hamish Linklater at the New Group, May-June 2017 | The Drama Book Shop, Inc. When, after much time away, Kristina (Maura Tierney) is back in Berkshire County, word spreads fast that she and her ex-husband are caring for their estranged, ailing daughter Julie. Broken-hearted and giddy with love and confusion, surprising visitors from Julie's complicated past, including her childhood best friend Trish (Zosia Mamet) and her former drug dealer, practically trip over each other to reach the young woman they thought they'd lost years before but still feel so deeply connected to. Heartfelt and compassionate, Hamish Linklater's The Whirligig spins a tale of a fractured community weaving a circuitous route back to one another.